No. 18 on the left of this pair of shops is part of the same building as No. 17 next door, and they are jointly Grade II listed (List Entry No. 1047347). 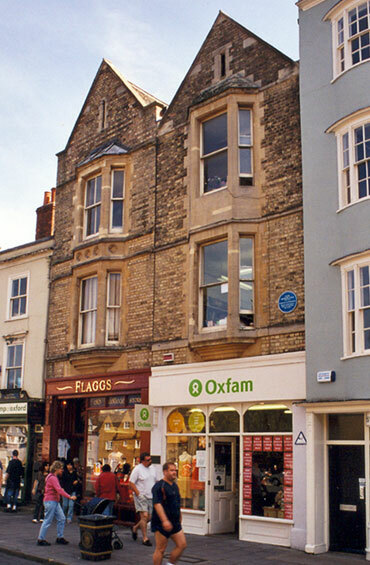 The present building dates from c.1897 and is owned by Oxford City Council. At the time of the 1772 Survey of Oxford the former house on this site was occupied by a Mr Smith, with its frontage measured as 5yd 1ft 1in. By the time of the 1841 census, the former building at No. 18 was occupied by John Cripps, a confectioner. Ten years later he was dead, and his widow Mrs Mary Cripps (51) was described as the confectioner. Her five sons (two of them “confectioner’s assistants”) lived with her, and they had one house servant. She was still there at the time of the 1861 census, when her son John Francis Cripps junior was also described as a “fruiterer and confectioner” and her youngest son was the “confectioner’s assistant”. For over seventy years in the twentieth century, the new building was occupied by Hunt’s office services, which started business at 19 next door in 1903.